#1) Autographs will not be available on orders placed after 9:00 AM on Dec 13. #2) According to the Post Office, the last day we can send Priority Mail (which is how we ship all orders) from Perryton with the expectation it will get to you by Christmas is Dec. 20. THEREFORE: Only orders received by midnight Dec 19 will be able to be processed with the hope that they will be delivered by Dec 24. A special surprise for y'all! 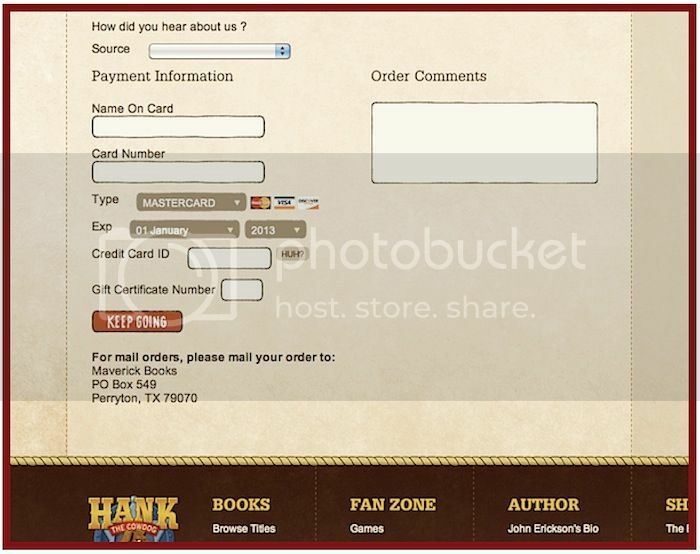 Here's an easy, how-to for getting GREAT Christmas presents for your friends and family: signed Hank the Cowdog books. Make your request (that those 2 be signed) in the "Order Comments" box shown in the picture below. p.s. Just so you know: Even though we do ship all books by Priority Mail, sometimes asking for a signature will delay your order by up to 3 days, depending on Mr. Erickson's availability to sign books. But, we'll definitely ship your order as soon as possible. We hope you (and the people on your Christmas List) enjoy them! Merry Christmas (yes, a little early) from all of us at the ranch!